Although monsters and robots have had their troubles in the past us monsters at Hip Monsters love Johnny Botts’ art. 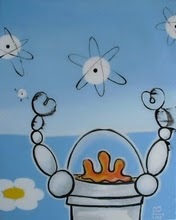 He makes portraits of robots that are more sentimental and lovable than most portraits of children. The robots have a genuine innocence about them that is enduring. Sneaking Cookies brings to life a robot child with a simple, retro-style drawing of an android stealing cookies while making sure no one is looking. The backgrounds are key to Johnny Botts’ art. 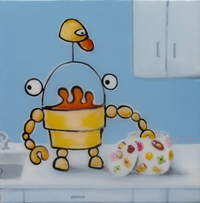 In this pieces the clean lines of of kitchen and cookie jar beautifully drawn, make the robot pop out of the piece. We enjoy your art- keep it up!